Lena is a young Jewish German immigrant who is making a new life for herself after fleeing Hitler’s Berlin, leaving behind her parents and boyfriend. Settling with an aunt in Chicago, she learns to speak English, gets a job as a secretary, marries a nice man and has a baby. Life in America is good even though things in Europe are falling apart. Things are good until tragedy strikes and Lena is forced to make some difficult decisions about her new country, her old country and her family. This story gives you the same feeling as a classic black and white noir film. I can feel Lena’s panic as things begin to happen that she can’t control. I could picture the small, slightly shabby apartment building and I could imagine the foreign accents of the characters as clearly as if I’d been there. The story succeeds because Lena is so relatable and the setting is so spot­on. 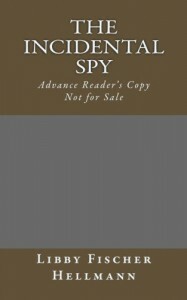 I’ve always enjoyed espionage novels and this short one is a very good. Libby Fischer Hellman has become one of my new favorite writers. Her ability to create atmosphere and write living, breathing characters is amazing. Many of her stories are set in Chicago, where she lives, and having lived there myself for a while, I think she captures the city beautifully. I’m not usually a fan of short stories or novellas and this one could definitely have been made into a longer book but I enjoyed it at the length it was. The shorter length ensures tight writing and quick action. I read this in one sitting and enjoyed it immensely. Book provided by Netgalley but my reviews are always my honest opinions.